Baltimore's acting leader has ordered an audit of a nonprofit's management of a city youth fund with $12 million set aside from property tax revenue after the organization was tied to embattled Mayor Catherine Pugh's hard-to-find illustrated books for children. 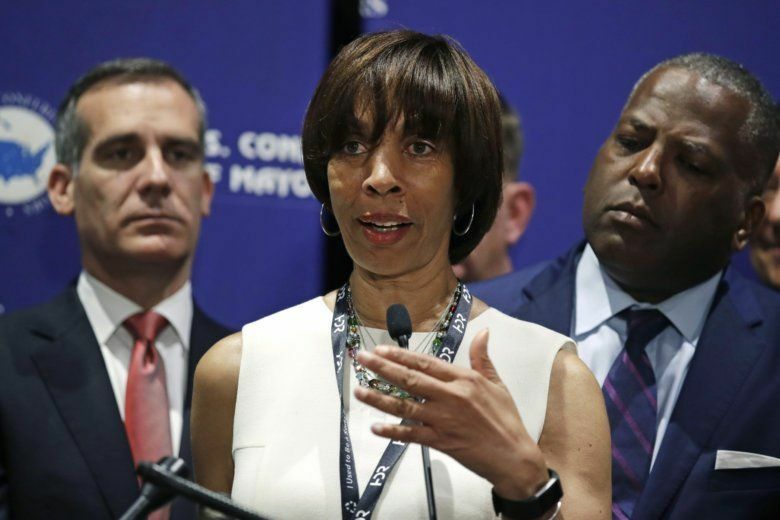 BALTIMORE (AP) — Baltimore’s acting leader has ordered an audit of a nonprofit’s management of a city youth fund with $12 million set aside from property tax revenue after the organization was tied to embattled Mayor Catherine Pugh’s hard-to-find illustrated books for children. The audit of Associated Black Charities’ work and a freeze of legislation that would renew its management of the taxpayer-financed fund comes as the first-term mayor is embroiled in a scandal that threatens her political career. “I want to ensure that the fund is being well-managed and that there are no conflicts of interest,” acting Mayor Bernard “Jack” Young wrote in a letter sent to the nonprofit’s CEO. A longtime city councilman, Young took over Pugh’s day-to-day responsibilities April 1, the same day Maryland’s governor asked the state prosecutor to investigate her alleged “self-dealing” book sales. As the scandal focused on her “Healthy Holly” paperbacks escalated, Pugh went on an indefinite leave, citing deteriorating health from pneumonia. In a news release issued late Thursday, Young portrayed the audit as necessary for “full transparency,” while also saying he had no concern that the group’s management of the taxpayer-financed Baltimore Children and Youth Fund is “related in any way to its relationship with Catherine Pugh” or her limited liability company. The $12 million youth fund was first proposed by Young after the massive unrest sparked by the 2015 death of a young, black man fatally injured in police custody. After a task force’s review, Associated Black Charities was picked to manage the fund and was officially authorized by a five-member spending board controlled by the mayor and included Young in his capacity as City Council president. Associated Black Charities got about $1.2 million to manage $10.8 million in grants during the city youth fund’s first year. In a statement issued early this month, Associated Black Charities disclosed that five organizations donated $87,180 to pay for “Healthy Holly” books, of which the nonprofit group kept $9,552 to use as “general support.” The money collected between 2011 and 2016 to buy and distribute 10,000 copies of Pugh’s books was made up of donations from entities including the CareFirst BlueCross BlueShield insurance carrier. But that’s just one part of the “Healthy Holly” saga. A growing tide of investigations has been spurred by revelations that Baltimore’s elected mayor was paid $800,000 over roughly eight years for tens of thousands of copies of her self-published children’s books. Pugh’s biggest customer, the University of Maryland Medical System, whose board of directors she sat on for nearly 20 years, paid her $500,000 for 100,000 copies. She’s since stepped down from the UMMS board and returned her most recent payment of $100,000. Health care provider Kaiser Permanente also spent roughly $100,000 on Pugh’s books after she became mayor, when the company was seeking a contract with the city. A financier donated some $100,000 to the mayor’s initiative, insisting he didn’t expect anything in return for his largesse. Numerous city and state officials have called for Pugh’s immediate resignation. On Friday, the board of the Greater Baltimore Committee, an economic development group, made the latest call for her to step down, saying the recent revelations into her actions as an elected official “have undermined her moral authority” to lead the city. Her spokespeople say Pugh fully intends on returning to City Hall when her health is better. Pugh’s lawyer has said she looks forward to cooperating with the state prosecutor’s criminal investigation. City Solicitor Andre Davis says only a conviction can trigger a Baltimore mayor’s removal from office.